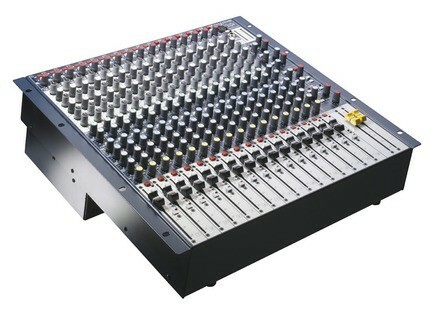 GB2R 16, Analog Mixer from Soundcraft belonging to the GB2R model. Soundcraft expands their popular GB series with the GB2R, a 19 inch rack-mountable mixer avaible either in 16 mono inputs or 12 mono inputs variants. The GB2R are 19 inch rack-mountable mixers designed specifically for smaller installations in churches and performance venues, or for small portable PA systems. The GB2R 16 version offers 16 mono inputs to a stereo mix output and the GB2R 12.2 features 12 mono inputs, two full-feature stereo inputs and two group busses, each model having 6 auxiliary sends. They inherits both the GB30 Mic preamplifier and GB30 Equaliser designs from the GB4 and GB8. Every input has a pre/post switchable direct output for recording or effects sends. The connector section is contained in a rotatable pod, allowing cable access from the top of the mixer if sat on a table-top, or from the rear when mounted in a 19” rack. On the stereo inputs on the 12.2 model, connectors are provided for both Mic and Line inputs. With Mic signals routed to the local channel, the Line inputs are available as stereo returns to the main mix bus. Two stereo returns and a 2-track input are also provided. An internal universal voltage PSU avoids external power supply connections.